A detailed look at Prey 2 reveals that there's not a whole lot of Prey to be found in the new game, which by all appearances is a sequel in name only. 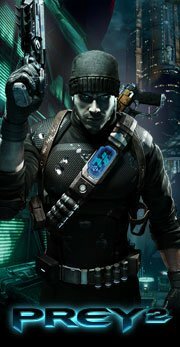 Bad news for everyone hoping that Prey 2 would pick up where the original game left off, with the intrepid Domasi "Tommy" Towadi plunging through a portal in pursuit of his ultimate destiny. (And if that's a spoiler, hey, the game's been out since 2006. Get over it.) Tommy is out, Native American mysticism is out, the Sphere is out and instead, according to Game Reactor magazine, we'll have an open-world game built on a blend of features and play styles taken from other games. The new game, as is already known, will feature an escapee from the original Prey story who's now working on a "seedy" planet named Exodus as the galaxy's lone human bounty hunter. That escapee is named Killian Samuels and he's a former sheriff and prison guard who was aboard the jetliner that crashed on the Sphere and subsequently battled his way off of the alien ship. He'll be "as flexible and limber as Faith of Mirror's Edge," utilizing parkour moves when fleeing from enemies, while a "Killzone-esque cover system" will come into play when he fights. "If the first Prey was the Luke Skywalker version of the story, Prey 2 is Boba Fett's story," a Human Head rep told the magazine. Gameplay is open-ended, with players able to go where they want and take on various missions set in cities, wilds, deserts and cave levels. "Every area is comparable to Assassin's Creed 2," the rep said, although in what sense wasn't made clear. Aliens are described as being "very human-like," similar in style to those of Mass Effect 2; weapons, armor and abilities can be upgraded via a Borderlands-like loot system. And although they'll be fewer in number and have "different looks," there will, thankfully, be "vag portals." All of which leads me to wonder why exactly this is being called Prey 2. I'm not going to shed tears over the absence of Domasi and company but I do have to wonder why, if literally everything from the original game (minus the opening scene) has been excised, it's being developed as a sequel at all. The obvious answer, that it's a cash-in on the name, makes sense only to the point that the name is worth cashing in on, and while I certainly enjoyed Prey I wouldn't consider it a high-value property by any means. Whatever the reason, Prey 2 is currently in development for the Xbox 360, PlayStation 3 and PC, and is expected to come out sometime in 2012.